Here, are the following tips that are needed to develop and make an emailer. 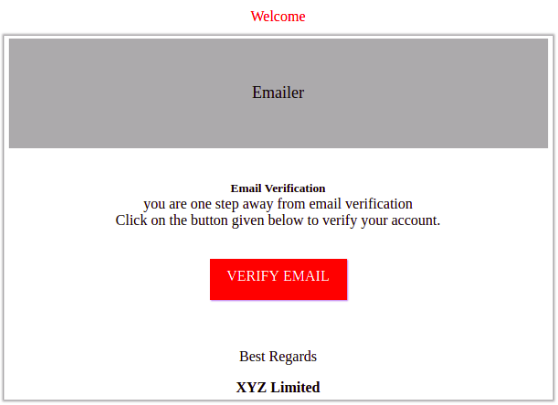 The emailer is mostly required in any project because almost every project which is developed needs to have an email verification process. so for that, we need an emailer just to send email verification to the users. Few Things to be kept in mind before starting the design of the emailer. 1) We have to make it inside the table tag. 2) It Should have a proper opening and closing tag. 3) We need to write inline CSS for it. 4) For adding images we must have the images on the same location. so that it can be picked easily. 5) Table tag does not accept padding property. 6) It does not accept a button tag also. So if you want to make a button then you must make it in the span tag. 7) A <tr> </tr> will work as a div in this. It should be made in proper html format. The table tag must be inside a body tag. Demo of the emailer. here is the simple example of any emailer. Click on the button given below to verify your account.